The other day I was subbing at the local high school and while walking down the hallway I noticed an awesome sign on a locker. I snapped a picture of it with my phone and knew that I wanted to borrow the idea for something else later. The phrase "Become Something Extraordinary" kept running through my mind. Too often we settle for less than extraordinary. Whenever I'm planning an event or trip for work...I try to think like Walt Disney or Chickfila. They both are masters at perfecting the details. When we learn to take care of the smallest details we naturally become extraordinary at whatever we're doing. 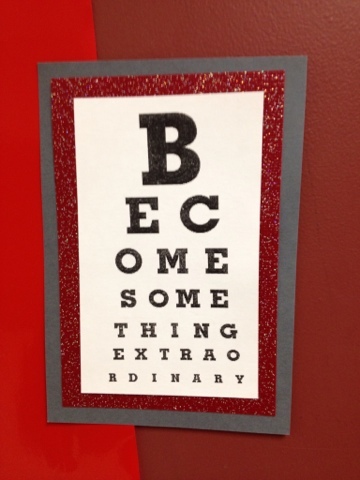 Whether it is running...your job...your family...become extraordinary!